With the ease of online shopping, we are gifting more and sending more via the courier network than ever before. The retail landscape is changing. It’s adapting to the new tech-savvy customer and businesses need to adapt their offering to the new normal. With flat-packed gifts now containing everything from food hampers to bouquets of flowers. The cardboard postal hamper box has become the retailers best friend. But how do you keep your costs down. How do you avoid overpaying for storage and ensure your products arrive in perfect condition? All the postal hamper boxes specified are held in stock, available for next day delivery. You’ll never need to tie up cash or valuable storage space. Protective packaging may not be the most glamorous packaging we sell, but it doesn’t have to be completely dull either. Turning a humble cardboard box into a beautiful gift is easy with our range of gift accessories. Cardboard transit hampers come in a variety of sizes, colours and materials. They’re ideal for mail order hampers or subscription boxes. All transit hampers can be used as a protective outer for a range of our gift packaging options, or as a stand-alone postal hamper. 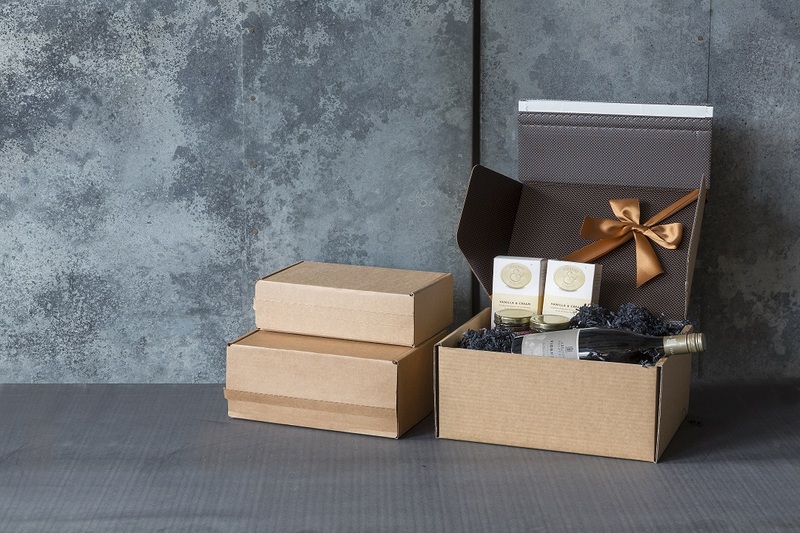 Simply make the box part of your brand by choosing from a range of shredded paper, wood wool ribbon. Then add extra security with bubble wrap before filling with product. Our most basic transit postal hamper is available in 2 sizes. It is made from strong cardboard and has an adhesive strip used to close the box for transit. These hamper boxes are a great affordable transit hamper for anyone who’s looking to send their products in the post without damaging items. Postal hampers come flat packed for ease of storage. They are also sturdy enough to carry jars, half size wine bottles and much more. *(Please note these are not suitable for wine bottles that require additional support. For bottle protective packaging, visit wbc.co.uk/bottle-transit-packaging). Dress with colourful shred, tissue paper and bows or ribbons and you’ve turned a simple cardboard box, into a gorgeous hamper in a few simple steps! Designed and produced in house at WBC, this transit postal hamper is practical yet stylish, and the perfect upgrade from the standard postal box above. Strong and super easy to use, it comes with a tear-off self-adhesive strip and adds value with gorgeous black and copper print on the inside. No fuss, no additional packaging and gives your customers something a little special when opening. All three boxes can branded with your logo, or overprinted with a special message. Branding is an easy and affordable way to promote your business. For information and pricing visit our printing services pages, or call our friendly team on 020 7737 440.